For a last hurrah to the summer, I took an impromptu trip out to Seattle for two reasons: see friends and eat oysters. After spending several days slurping West Coast gems around The Emerald City and doing semi-touristy things, here’s a recap of the highlights. The first and most obvious oyster bar to talk about is Elliott's Oyster House. This seafood institution has just about everything: a massive oyster list, dozens of delicious wines, phenomenal appetizers, and signature entrees. Plus, they've got an outdoor space that stretches the better half of Pier 56. Thanks to the amazing weather, we were able to savor the fresh air outside while enjoying happy hour. Happy Hour deals are popular around the city (there's even an app that tracks all of them... why don't we have that in NYC?) and Elliott's is no different. They start at 3PM with a $0.75 oyster special. Then at 4PM it increases to $1.25 and then to $1.75 at 5PM. The competition for oyster bar seats is fierce, so make sure you get there plenty early. Also, don't let the impatient glares from hungry Happy Hour fans intimidate you. When you go, be sure to walk PAST the first Elliott's oyster counter that's facing the street. There is a separate entrance for the oyster bar a dozen or so steps down the pier. The oyster menu at Elliott's is part geek, part tease. It lists out every single variety of oyster that they carry, along with its origin and grow-out method (first time I've seen this on a menu! ), but will only place checkmarks next to those that are available. I got super excited to see Olympias and European Flats on the menu, but was later let down by the aforementioned caveat. 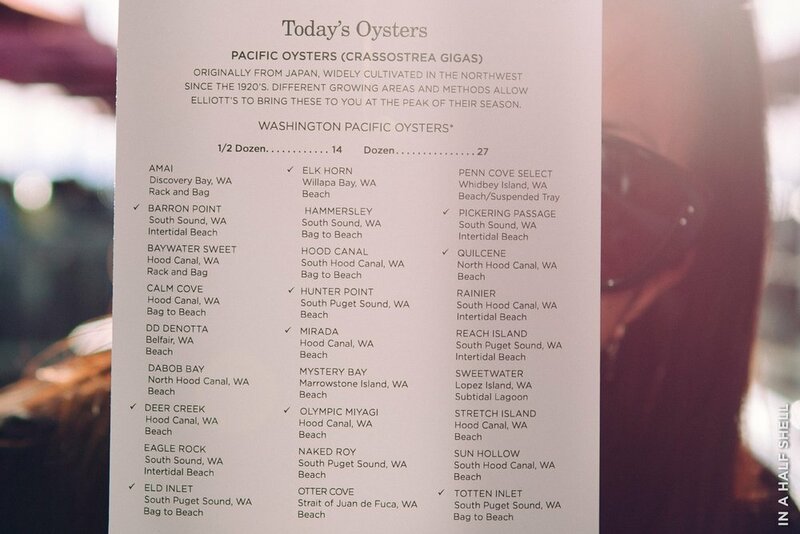 Still, we managed to try a bunch of delicious west coast varieties. Flavor: 6 | Salinity: 7 | Sweetness: 6 | Texture: Soft, pillowy These petite palette pleasers had a really sweet and satisfying flavor of edamame. Flavor: 8 | Salinity: 9 | Sweetness: 8 | Texture: Chewy, firm, crunchy at times Bright, briny, and rather large -- these savory oysters were packed with a mineral punch. Flavor: 6 | Salinity: 7 | Sweetness: 7 | Texture: Plump, creamy These oysters are impossible not to love: perfectly sweet, fruity, and creamy bites. Flavor: 8 | Salinity: 5 | Sweetness: 6 | Texture: Creamy, chewy Relatively mild flavors compared to other west coast oysters, but nonetheless delicate and balanced. Flavor: 7 | Salinity: 4 | Sweetness: 5 | Texture: Thin, soft These slender oysters tasted quite fishy -- in a good way -- at least in moderation. We also ordered the fried calamari and famous crabcakes, which I'd highly recommend trying. Overall, Elliott's is a great place to check out when you're visiting. It's conveniently located to some other cool attractions such as the newly installed ferris wheel and Pikes Place Market. This is the view of the Sound off the pier just beyond Elliott's Oyster House. Gorgeous right? Make sure to go when the weather is nice... I heard that you typically can't see these breathtaking Olympic mountains! Early September may be the way to go. Next up is Renee Erickson’s The Walrus and the Carpenter in Ballard. First thought I had while entering the space was, "Did I really leave NYC or am I back in Brooklyn all of the sudden?" The reclaimed decor, the quirky characters behind the counter, the matter-of-fact menu... just about every minute detail was carefully considered, pondered, and crafted. The only thing that didn't feel like it belonged were the baskets of Walrus & Carpenter t-shirts stored atop the wine cabinet. Although it took us about an hour to get off the wait list, we didn't really mind. We sipped dark & stormy's and nibbled on phenomenal salmon at the adjacent restaurant, Staple & Fancy Merchantile. I would highly recommend checking both restaurants out. Perhaps doing oysters first at Walrus & Carpenter, followed by a meal at Ethan Stowe's Staple & Fancy Merchantile. The other way around seems to work too! The Walrus & the Carpenter oyster menu isn't nearly as extensive as Elliott's, but I appreciate restaurants that are confident in their limited selections. It ensures that the product is at its very best. The shucking was impeccable. Each oyster sat very pretty in its shell, that is, until I came along. Flavor: 6 | Salinity: 6 | Sweetness: 7 | Texture: Creamy, soft This crisp, sweet oyster had a miraculously delicious after taste ... of lettuce or something? Flavor: 5 | Salinity: 7 | Sweetness: 7 | Texture: Chewy, semi-firm Petite, but very savory—they possess a delicate seaweed taste and clean finish. I have four words -- Late Night Happy Hour. It's a must. It's famous and now I know why. Fried oysters, raw oysters, pork belly, po'boys, the works. Nearly everything from the regular menu was offered and half price. We ate and drank like kings for a fraction of the price. On Wednesday nights, they also bring in a DJ to amp up the mood. "I'll have one of every special," was the phrase that I uttered to the head sushi chef. That was precisely what I got. Favorite was the buttery, dreamy albacore belly. Chanterelles egg scramble? Yes please! This farm-to-table, local, organic haven just a couple blocks up from where I was staying in Belltown was the perfect brunch spot. Now here's a concept that's new to me. A non-profit restaurant... they train low-income or homeless citizens to work in the kitchen. Once having graduated the program, many find work in restaurants around the city. To help work off the many meals consumed, I did a bit of sea kayaking around West Seattle and the Sound. Thanks to Scott from Alki Kayak Tours, I learned how to brace semi-turbulent waves like a champ. When I signed up for the tour, I had no idea that it was a one-on-one deal. So when I found out that we were all on our own, it was better than what I had expected! If you like kayaking, I'd highly recommend taking the Lighthouse tour with Scott. You'll get to see the charming lighthouse, many mountain ranges and peaks (if you're out there on a good day), sea lions and seahawks, and maybe even the Statue of Liberty (not kidding). Last, but certainly not least is Taylor Shellfish Farms at Melrose Market. It's now my favorite place to go for oysters in Seattle. The store itself was very unique. It's part market, part oyster bar. The cashiers were also the shuckers. There were high stools, a chowder bar, and a selection of fine oyster wines curated by no other than the late oyster wine aficionado Jon Rowley. I met up with Jon at Taylor on Saturday evening a short while after returning from kayaking. While Jon was rather calm about being in a room with oodles of shellfish and crustaceans, I was brimming with glee. I felt like a kid in a candy store... of geoduck, Dungeness crab, Kumamoto oysters, and the plumpiest of plumpest mussels. We ordered a dozen or two Kumamotos and Kusshis, scallop ceviche, and geoduck sashimi. Words cannot describe how happy I was right then. For those who have not tried geoduck, or know what geoduck even is, make it your mission to do so. As pictured in the gallery, geoduck is a rather phallic looking mollusk. Want to know what else? They squirt at random. No joke. But in sashimi form, this seemingly crass clam takes on an astonishingly delicate and refined flavor. It has a crunchy, smooth texture and a subtly sweet finish. It's no where as complex as the oyster, but sometimes, I crave it more. It was difficult to leave this beautiful city. I am definitely returning next year for more eats, kayaking, and fun!